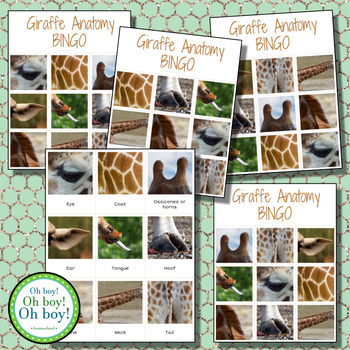 Engage your little biologist, zoologist, or mammalogist with this montessori-inspired anatomy bingo game! 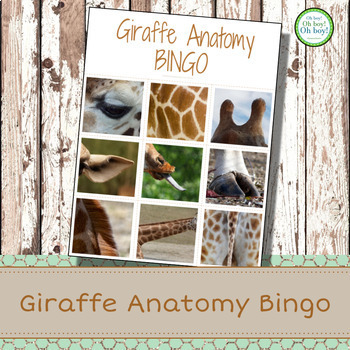 Giraffe Anatomy Bingo Game: Includes are 4 different bingo game boards featuring 9 different giraffe anatomy parts. The cards to draw include the anatomy names for identification. This download includes 4 - 8.5x11" bingo game boards (each one is different) and 9 bingo drawing cards. 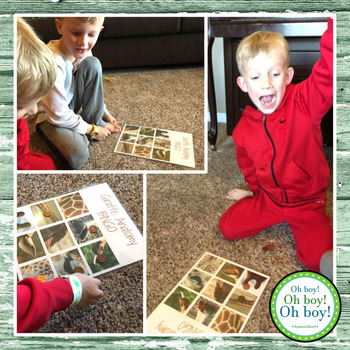 For longer durability: print on white cardstock and then laminate the bingo boards and drawing cards. Give each player a bingo board. The announcer should pull out one drawing card from an upside down card pile. The caller may choose to either show the card or recite the anatomy name. The players will then use small objects to cover the image that was drawn. To win the game, a player must have three anatomy pictures marked in a row. Then the player calls out BINGO! ***Copyright © Oh, Boy! Oh, Boy! Oh, Boy! Homeschool. All rights reserved by teacher author. This product is to be used by the ORIGINAL downloader ONLY. Copying for more than one teacher, classroom, department, school, or school system, etc. is PROHIBITED. If these individuals would like to have their own copy please REFER them to my shop. This product may not be distributed or displayed DIGITALLY for public view. Failure to comply is a copyright infringement and a violation of the Digital Millennium Copyright Act (DMCA). Intended for classroom, homeschool and personal use ONLY.